Are you looking for a new way to make roasted potatoes? 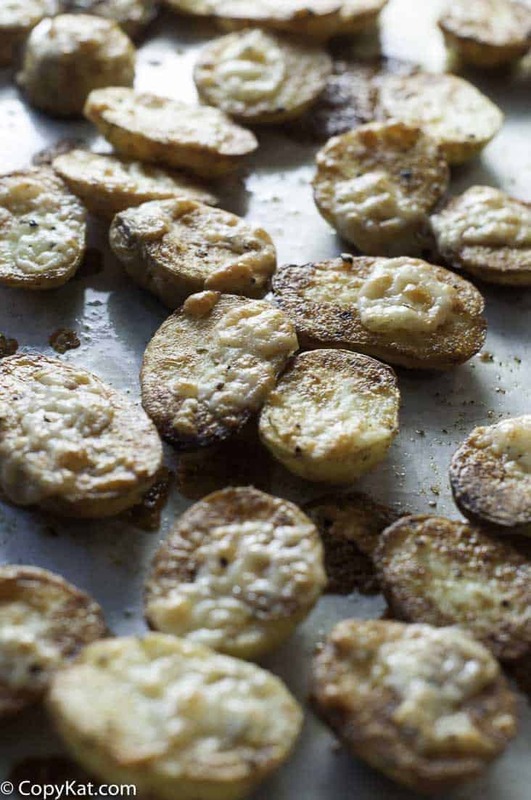 How about some delicious Parmesan Roasted Potatoes. Are you looking for a new way to prepare potatoes? Maybe just like you I work long days, and I think there is nothing better than a home-cooked meal in the evening. Roasted potatoes are the perfect side dish for anything. Roasted potatoes go with chicken, meatloaf, or even a quick grilled steak. Baked potatoes are a simple dish to make. You know what is better than simple roasted potatoes, I will tell you what, it is Parmesan roasted potatoes. Parmesan cheese adds a little something extra to the potatoes, and I promise you are going to love these crispy and cheesy potatoes. In many produce departments, they sell small bags of potatoes that are bite-sized. They are pre-washed and ready to turn into dinner. Since you don’t need to wash these potatoes, you can slice these, drizzle on some olive or vegetable oil, then season with salt and pepper, and roast until they are brown and crispy. Then you will sprinkle on some Parmesan cheese and allow them to roast a little longer. Then the cheese with brown and add a lot of extra flavors. Since you are using small potatoes this won’t take very long to cook at all. While these are in the oven cooking, you can grill up a steak, or saute a chicken breast, and in less than 30 minutes you will have dinner on the table. So I bet you are wondering do you need to buy those bags of small potatoes to make this recipe? No, you can use regular potatoes as well. Are you looking for other great ways to prepare potatoes? Here are some ideas. Parmesan Roasted Potatoes are so easy to make. Preheat the oven to 425 degrees. If you are using small potatoes be sure to make one cut in them. Cut larger potatoes into small pieces (this way they will take less time to cook). Place potatoes into a bowl and drizzle olive or vegetable oil over the potatoes. Season potatoes and salt and pepper. Place potatoes on the flat or down onto a baking sheet. Bake the potatoes for about 30 minutes or until they begin to crisp. Flip the potatoes over and sprinkle with Parmesan cheese. Place potatoes back into the oven and cook for another 5 minutes or until the cheese begins to brown. There are different grades of olive oil. The lite ones can be used for roasting but if you want to use the extra virgin, it is best left for drizzling after the dish is cooked. You can dry roast potatoes. I avoid canola if I can. No GMO in my house. Please don’t fry with olive oil and there are other oils such as seseme and peanut that can take the heat. All oils impart a flavor. If you use Pinterest there are some infograms that tell what oils to use and when. MYTH, MYTH, FALSE! Please stop spreading falsehoods. It’s not true. Many substances share similar chemical structures or compositions, but it’s the variations in these structures or ways they are arranged that make a difference in their properties and to the end product. Most types of margarine are blends of vegetable oils, while plastics are usually a polymer (chain of repeating molecules) of ethylene molecules (four hydrogen atoms and two carbon atoms). Even if they were both made from vegetable oil the variation in their chemical structures would result in different end products. So adding another molecule to margarine does not turn it into plastic. The bottom line is that many substances share similar chemical properties but even the smallest variation can set them a world apart in terms of what they are. I am so sorry this was confusing. So let me address both points. The potatoes, I suggested for you to buy the bag of small prewashed potatoes. If you didn’t want to do that, you could use regular potatoes. Regular potatoes would require a little more cutting than the small prewashed potatoes. Secondly, I use shaved cheese in the photo, when the cheese melts it really doesn’t matter. Grated, shaved, or shredded, they all work fine. Let me know if I need to help out in any other way. I have made these several times in the last year and they always turn out perfect and everyone loves them. My son-in-law must have ate three whole potatoes in two days, he loved them so much! The eerie thing is, I just sent this recipe today to my other daughter just before this post. Try them…they are wonderful!!!! So easy to do, but still so delicious. Thank you for inspiring me and everyone else.